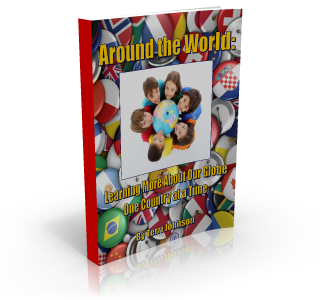 This full-color e-book, featuring 9 different countries from around the world, is chock full of fascinating information, beautiful photos and fun activities to help you & your children learn more about our amazing world and the people living on it. Right-click the Download button or the e-book image above and choose "save target as" to begin your download. Should you need any assistance, please do not hesitate to ask. You may write to helpdesk@kqpublishing.net. Have a great day! You are welcome to print a copy of this ebook for your own family's use. We hope that you enjoy it thoroughly. We do ask, however, that you refrain from printing this book for an entire co-op, classroom or school. We have special pricing to make this an affordable option for groups. You may view our discount schedule here. View the rest of our product line, including the brand new A Child's Geography series and the What Really Happened... series.